I’ve tried to take the advice given by ‘Bread’, or Telly Savalas depending on your tastes, by including as many pictures as possible in this blog, but Ubungo is not a place to start flashing a camera at 5am so, as that visit to ‘Q’ is still on hold, I’ll try to draw some pictures with words to give you some idea of Ubungo Bus Station, Dar es Salaam. I know I mentioned it very early in my blog but believe me I didn’t do it justice. It’s 5:10, we’ve left the hotel in Mikochenie B, gone down Coca Cola Road and are approaching the city down Sam Nujoma Road. Even at this early hour the traffic is starting to build up and the queues for the city equivalent of Daladalas are forming along the roadside. As we turn onto Morgoro Road a collection of Taxis, Coaches and private vehicles cram the inside lane as they wait to turn into Ubungo. You realise yet again the size of the place. 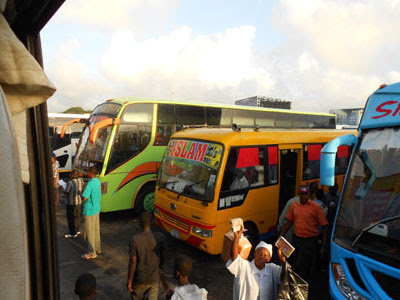 The bus park holds upwards of 200 ‘coaches’ and with many of these holding over 60 passengers, the throng is gathering. Karim, as ever my guide and mentor, deflects the ‘helpers’, although I’m getting quite adept at this myself now, and only after I’m settled in the Simba Mtoto (Lion Cub) coach, does he finally leave me and return home to the bed that he had only used for four hours last night. As I was one of the first passengers on I did take a quick snap of the inside. I sit back in my seat, slide the window open as the A/C has not been switched on yet, and survey the scene. Hundreds upon hundreds of people being harangued by the various individuals who earn a living at Ubungo. The ‘Barrow boys’ with their two wheeled luggage trollies, carefully watching every car as it comes in to drop off, and with practiced eye calculating which is the one to race after and offer their services, shouting through the window as they race next to the car that, now it has left the bottleneck of the entrance, is accelerating towards the parking bays. The ticket sellers looking like ‘on course’ bookmakers, with their clip boards in hand and pen tucked behind their ear, vying with each other for custom, sometimes arguing with rival company representatives near them and in one case, my first sight of any violence in Tanzania, the finger stabs into the chest almost leading to real blows but for the restraining colleagues around them. To continue the analogy, the bookie's runners whose job is to grab as many wayward souls as possible and lead them to their main man, constantly shouting out Tanga or Dadoma or Kilimanjaro or any other of the destinations available. The food, water, newspaper, lighter and general souvenir sellers moving between the buses with their wares perched on top of their heads, taking in an average person’s lifetime intake of carbon monoxide in the time I watched them, as the vehicles, still with over thirty minutes to go to departure, start revving their engines. The customers lean down from their perches on high, receive their purchases from the seller, also at full stretch, and having shown their money, wait to receive their change before handing down the larger denomination note. The customer is in a fixed place; the vendor isn’t, and many an innocent traveller has seen the bus station disappearing through the back window as the seller ‘searches’ for change from a colleague. An imperious man in pristine creased cream trousers and white shirt, with what could pass for a regimental tie, moves around the area, with a measured stride and posture that also hints at an army background. His shaven black head glistens in the street lights and his whole demeanour points him out as a person of authority, much more than the identity badge clipped on his breast pocket. Too far away to see the title, but everything else shouts - boss. The incongruous sight of a Masai, in his usual attire of full gear right down to the large knife strapped to his thigh, walking past, trundling a ‘carry on’ suitcase behind him. As my window is open there is no smoked glass to hide behind and the sight of a ‘mzungu’ is still enough to get a glance from many off the passers-by, but even a quick inclination of my head is enough to get a smile and a raised hand of salute. 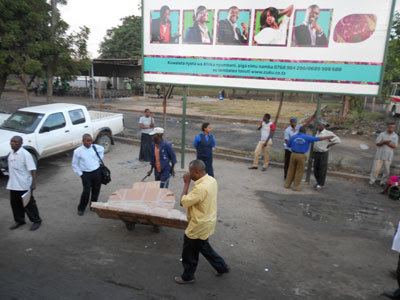 Even at 5.45 in Ubungo the inherent friendliness of the Tanzanian cannot be dampened. I look all over to see if I can see an example of the too friendly inhabitants who are supposed to inhabit the area, willing to put friendly hands into friendly pockets, so that you walk around with paranoiac tapping of each pocket in turn, but they must be too quick for me, or it isn’t crowded enough where I am watching. And finally the noise. The vehicles revving up and the noise of the engines plus the shouts of all the different groups of people described above leads to a cacophonous noise. Eventually 6:00 arrives; my ticket says 12:00 and, although I’ve explained that one already, I wonder how many ‘newbies’ will miss a bus by six hours today. The bus starts to move; all of two metres. We now have the task of discharging over 200 buses into a bottleneck that is one bus width, that leads out onto a road that is already congested with the traffic arriving for the daily grind. The drivers start their game of ‘chicken’ to see whose nerve is going to crack first, as they swing their billion shillingi vehicles millimetres away from each other. Leaving Featherstone Rovers car park doesn’t come within a million miles! It’s 6:30, we’ve moved 30 metres, that’s a hard fought metre every minute, but finally we’re in the main stream with the exit in sight and, as long as we can ensure that we drop behind the coach in front by no more than half a metre, we should be on our way. As we drive down this last section there is time to stop and admire (?) the livery of the various coaches that we pass, all waiting their chance to ‘nip in’, given the chance. There must be an annual award for the most garish coachwork as we move past the vivid colours, coupled so often with religious messages – Only God can provide - on the windscreen and back mudguard. Others look as if one of the local East African graffiti artists has been employed to add their ‘tag’ to the coach. It’s light now and work has started for many other people. One poor delivery man will have to wait quite a bit longer to get across this road though, unless he can squeeze his load onto its side through the gap between one rear bumper and the front of the one behind. Eventually the cavalcade is on the road. Coaches to, Dadome, Tanga, Moshi, Arusha, Mombassa etc are waved through the junction I had rounded over ninety minutes before, on to the road west out of Dar, only to grind to a halt. 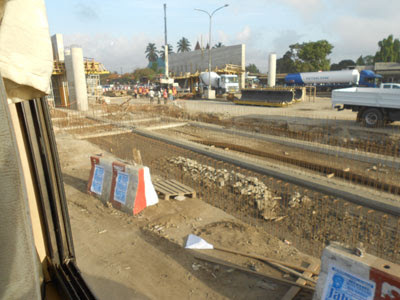 They are building a new road out of Dar and whilst the middle of the area is taken up by the road works, the coaches and lorries have to drive on the rough dirt track on either side. 7:00 am, we have made three kilometres from Umbungo and with five hours journey ahead we are finally in moving traffic and the journey is under way. I have covered at length the delights of the road to Tanga so will not repeat this, except to say that, as on the way down, the extra £1.20 is money well spent. Everything went well until we were four hours into our journey and we ground, yet again, to a halt. A collision between two cars had happened not long before we got there and the road was blocked, and remained so for nearly the next two hours. The coach might have A/C, reclining seats and all other mod cons but the most important need at this time was not there and a steady stream of ladies and gentlemen hopped off the coach to visit the ‘bush toilet’. I decided to wait for Shillingi VIP to catch up and use this for the journey back to Pangani so went inside a bar by the square to have a Fanta, and whilst in there saw a counter for a new bus service. 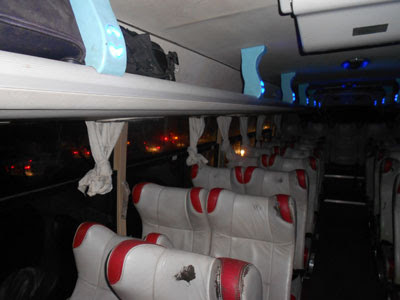 New in Tanga but apparently well established in Kenya and Uganda, this one is Mombassa to Tanga to Dar and the poster for the company shows the coach has three classes within the one vehicle. Economy class at the back, which still looked good, business class in the middle, which looked better, and four individual VIP class seats at the front of the coach. 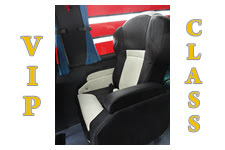 Economy cost Tsh13 000 (1 000 over standard basi), business class 16 000 and the seats at the front Tsh 23 000. Below is a picture of what £9 would buy you for the six hour journey to Dar. Hang on, that’s all of £4 more than the juddering, hot, dusty, ever stopping, crammed experience I had on my first journey north. Can I afford it? Too true I can! So I am now the proud possessor of the first ticket sold for the ‘Modern Coast Express’ flyer leaving Tanga at 10:30am on Saturday December 8th. I'll let you know how it feels to travel VIP. I arrived home to an ecstatic welcome from Chita, but to find that Pola has a badly bitten foot. No one knows how it happened, but he is limping around fairly happily. Having had two nights and two coach journeys with A/C I am busily re-adapting but, it’s ok, I still don’t expect sympathy. Going back to my first paragraph, if I could have taken two more pictures I could have saved you all this reading!